When it came time to think of what food to serve the guests at my daughter’s Frozen birthday party, I borrowed ideas liberally from other amazing home Frozen parties, like this party from my friend Sara of the blog Mom Endeavors. 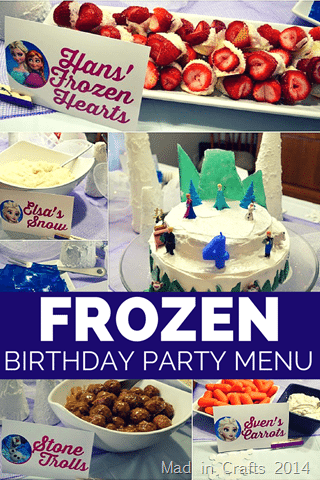 I combined those ideas with the menu that I served for my son’s Snowman party a few years ago and BOOM! party menu planned. I went to a local restaurant supply store and bought frozen meatballs and packages of frozen mashed potatoes. When you are serving larger groups of people, look into restaurant supply stores for tableware and premade food. The bulk prices are more affordable than regular grocery stores, and you will save yourself some prep work. 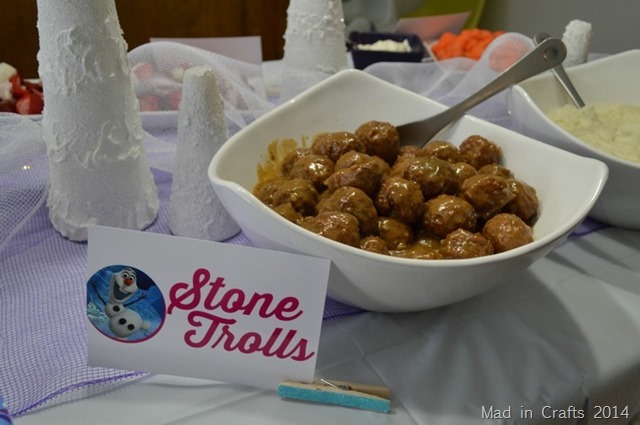 Since the plain meatballs needed a little fixing up to become Stone Trolls, I cooked the meatballs in my crock pot with this homemade Swedish meatball sauce recipe, doubled. 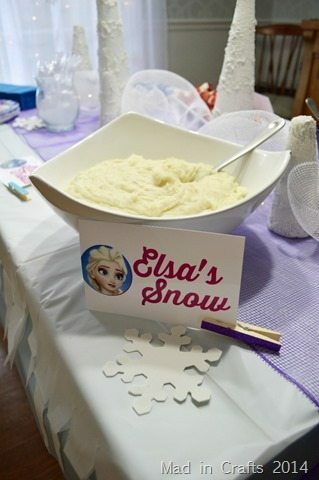 The premade mashed potatoes also spent the afternoon in the crock pot, so they were piping hot to serve as Elsa’s snow. 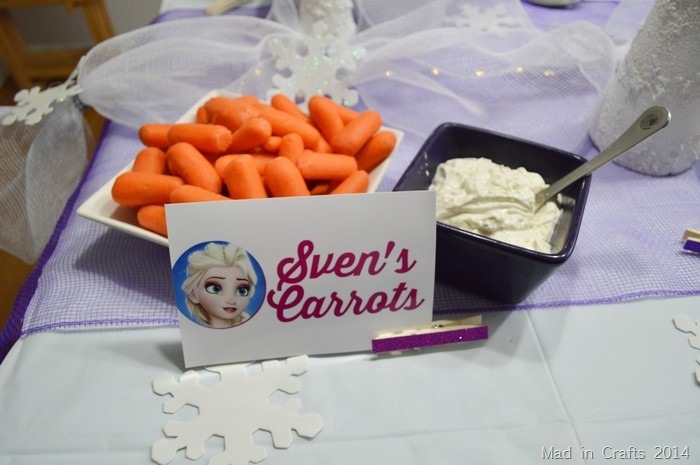 Sven’s carrots and some garlic dip served as the vegetable offering for the night. 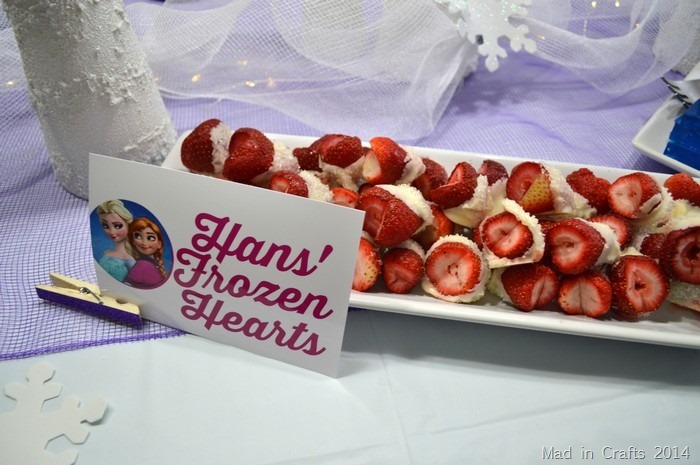 Hans’ frozen heart may make me mad in the movie, but these treats made our guests plenty happy. I cut whole strawberries into heart shapes, and dipped them in almond bark and sprinkled them with Wilton white sparkling sugar. 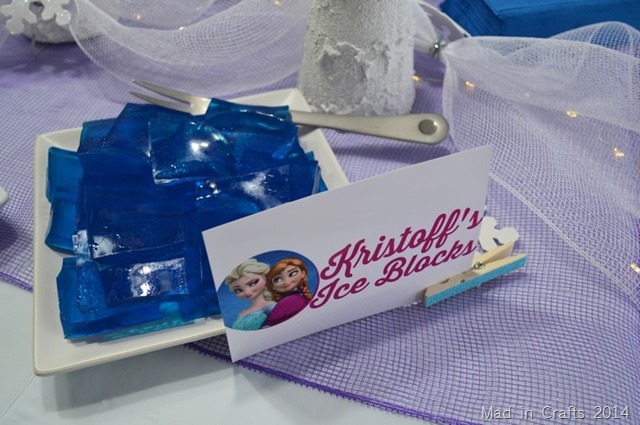 My mom made blue jello jigglers to represent Kristoff’s blocks of ice. I created the food signs in Picnik and printed them off on photo paper. I decorated dollar store clothespins with glitter tape in the party colors, and used those to prop up the signs. On our drink station, I set up two big drink dispensers. The first was filled with Olaf in Summer, aka ice water and re-freezable blue and white ice cubes. 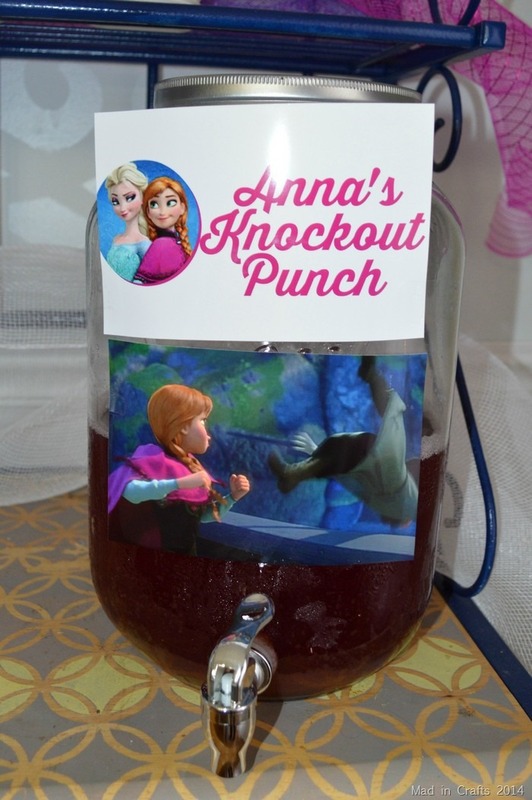 The other dispenser was filled with Anna’s Knockout Punch. I followed this recipe, but I substituted an apple soft drink for the ginger ale. I had to double this recipe as well. 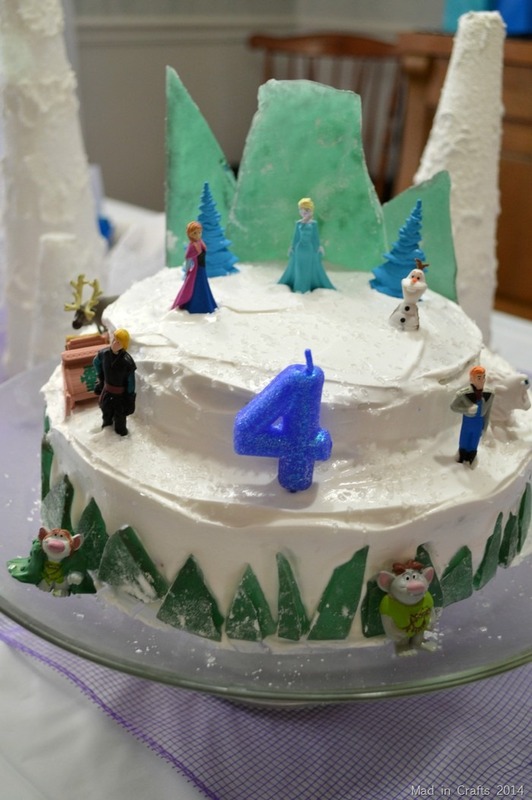 I completely copied the Frozen Ice Cream Cake from Bubbly Nature Creations for my daughter’s cake. I even purchased the same tiny Frozen figurines that she used for her cake. Imitation is the sincerest form of flattery, right? 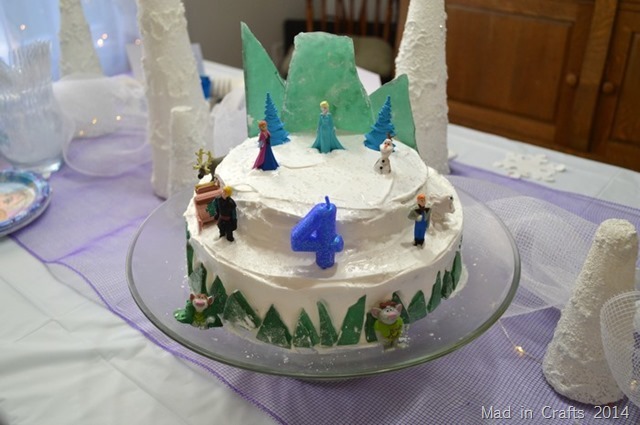 The birthday girl requested a lemon cake which I attempted to make the color of Elsa’s dress. 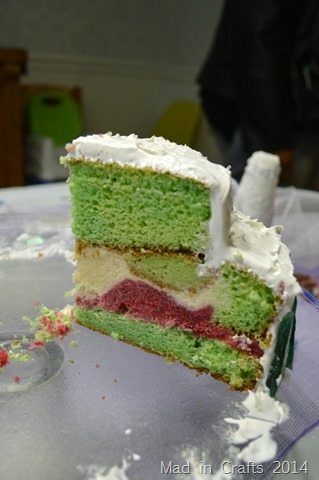 I topped the bottom layer of cake with raspberry filling and filled the center of the top layer of cake with vanilla frosting. Instead of not using the cake that I had cut out of the top layer to make room for the ice cream, I set it on the top of the cake like a smaller second tier. I frosted the cake with my trusty Bettercreme frosting. The frosting got a light sprinkle of sparkling sugar before I added on the figurines and rock candy decorations. This is probably the fanciest kids birthday cake I have ever made, and it’s the first time I didn’t have any major mishaps along the way. Maybe my cake curse has finally lifted! I love a good party menu complete with dorky themed foods. It just makes me happy. For the other party menus we have done in the past, check out my birthday party gallery. 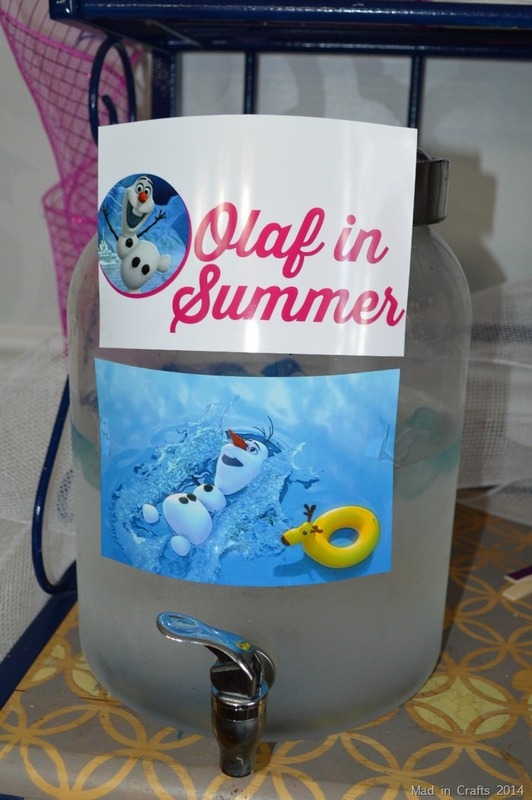 Be sure to check out all the other posts from the Frozen party too! Do you happen to have printables for all the food signs?? Too cute! How did you print the signs? It’s all adorable!! Thanks, Gywn! I made up the images in PicMonkey and then I sent them to Walgreens to have them printed as photos!